I loved Arthur Golden's book Memoirs of a Geisha which I read many years ago, so it was a nice throwback when I saw it had been chosen as the theme for the Library Challenge, which is for crafters who love books. I had a pack of both outline stickers and die cuts I bought years ago that I never really knew what to do with, in the shape of Oriental dresses and fans. They are quite detailed and large so take up most of a typical card and I was never really sure how to make the most of them. They seemed just right for this particular card challenge so I decided to make a very quick and simple card using one of the colourful cardboard die cuts. I used a pre-printed card blank which creates quite a busy pattern with the die cut, but the colours and flower shapes are complementary at the same time. 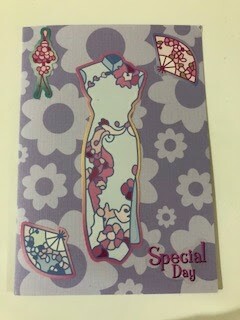 I finished the card with a pink 'special day' sticker. I really like your card. It's always nice to find a way to use something that you haven't been able to before. This is a lovely card , with a fresh , spring fee.Perfect for the challenge. Thanks for joining The Library. Beautiful card Caroline - I can see you are loving the Library Challenge as much as I am. Great to combine my loves of craft and reading!